Philadelphia Eagles defensive end Chris Long celebrates on the bench against the Minnesota Vikings in the NFC Championship game at Lincoln Financial Field. 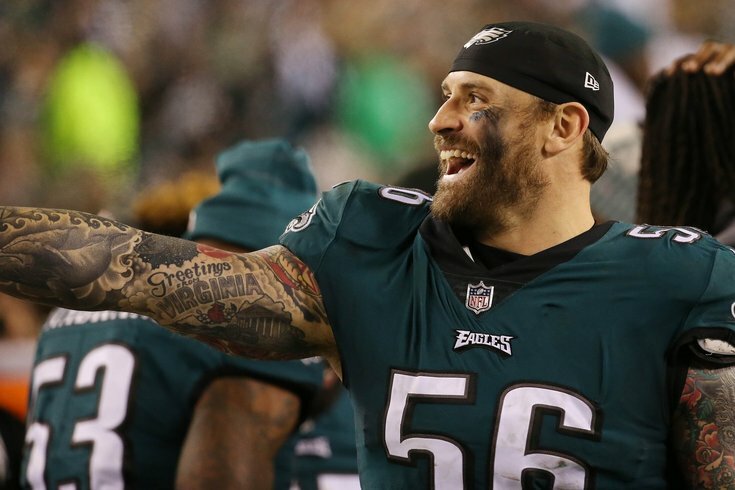 By NFL standards, Philadelphia Eagles defensive end Chris Long is kind of entering old age at 33 years old. As a young man, Long was the second overall pick of the former St. Louis Rams in 2008, meaning he made a boatload of money from the outset. The five-year rookie contract Long signed (this was before the new collective bargaining agreement created a rookie pay scale) was worth $57.75 million. A four-year extension in St. Louis, not including the final year of his rookie deal, added another $48.2 million. What followed those eight years of mediocrity in St. Louis is now well-known. Long signed with the New England Patriots for the 2016 season and won the Super Bowl. The next year, he joined the Eagles and beat the Patriots in the Super Bowl, just as LeGarrette Blount did. But the key detail in Long's 2017 season, apart from his relentless third down pass rush, was his decision to donate his entire salary to educational advancement in underprivileged communities. Long has received plenty of well-deserved praise for his philanthropic contributions. Was he always such a magnanimous man with his money? The garish coat he wore at the Super Bowl parade might have signaled otherwise. In a recent interview with CNBC's "Make It," Long explains that the first big purchase he made with an NFL game check was a Cadillac DTS. "I thought, like, 'I'm making a good choice here because I'm not buying the, like, H2 or the Phantom that a lot of my teammates were buying," Long said. "And it was the truth because I got tired of it pretty quickly." As CNBC points out, the Cadillac DTS cost somewhere in the range of $43,000 near the time Long leased his. He eventually got rid of it. Here's a look at the car's model that year. What Long failed to mention in this segment is that he actually did buy a Hummer H2 some time during his rookie year. He said so himself during a 2008 interview with MyRide. "I have a Hummer H2, a Cadillac DTS, and a 1983 Mercury Grand Marquis," Long said at the time. "I got the Grand Marquis because I wanted to fix up an old car, but the Hummer is what I've put the most energy into. Lots of modifications and it's sitting on 26's. The DTS, I love for its smooth ride." It'll be up to Long when he decides to walk away from football, but he's already got his retirement vehicle all picked out. "Definitely a Lincoln Continental," Long said. "Maybe a '67."